Luxury is one match away with this new eye-catching collection. 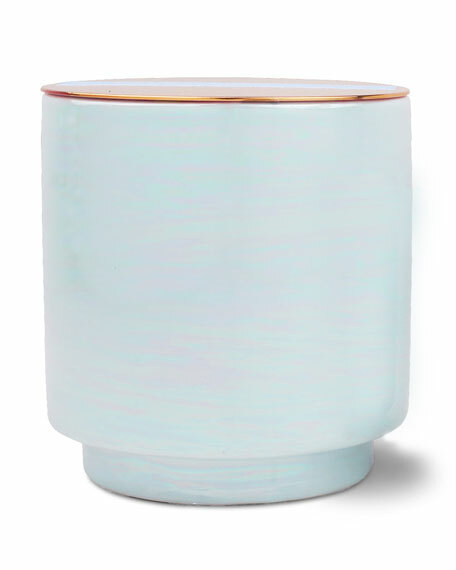 A beautiful, Glow 17 ounce iridescent ceramic vessel with copper lid. Whether it's sights or smells, these candles are sure to turn heads in your home. As any host knows, atmosphere is an overlooked, yet crucial aspect to any good party. The more you do to make your guests at ease, the more they'll enjoy themselves. Our pleasing fragrances and flickering wicks do just that! Lighten the mood of a space with our bright, airy, and herbaceous fragrances. Or create a calming environment with our earthy, musky, and woody fragrances. No matter your style, you can rest assured that you're getting a high-quality, earth-friendly candle. Each candle features our soy wax blend hand poured into an easily repurposed vessel with cotton wicks. Each earth-friendly candle features a special soy wax blend that's hand poured into an easily repurposed vessel with cotton wicks. The result? A beautiful, aromatic, well-made candle every time.